I needed to create one of these for a project elsewhere, so I thought I would post a couple of them here too – since I’d gone to the effort to make one at all! It’s not a new Sudoku variation, but just a very simple replacement of the digits 1 to 6 with shapes. None the less, it does make the puzzle notably harder to solve (or maybe that’s just me!). Unless there’s demand I won’t post this variant again, but I thought it would make an interesting change just for once! 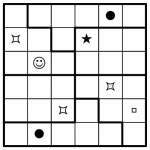 I’ve created two examples – one is a simple 6×6 jigsaw, and the other is a 3-grid 6×6 Samurai Stack. In each case place one of each symbol into each 6-square row and column of each underlying 6×6 grid, and also one of each symbol into all of the bold-lined jigsaw shaped pieces.